This past month has been a fun one for Bronte. 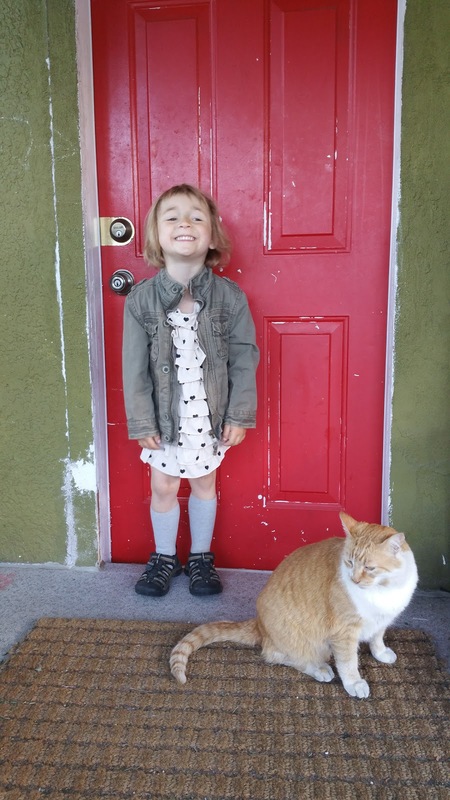 She finished her first year of preschool, sort of got a cat (a neighbourhood feline has decided to hang out at our house every day), & went bike camping. I love seeing her personality develop. Her sense of humour has always been there, but besides being a bit of a ham, now she's starting to tell jokes. Her social nature makes travelling more fun, since we end up talking to far more people when she's around, since she's always asking dog owners if she can pet their animal or waving comically at anyone we pass. She is becoming more & more independent, as well. She regularly helps herself to snacks from the fridge & freezer, often things she shouldn't be eating, like popsicles for breakfast. She loves to pick out her own outfits, which tend to include layers of skirts, clashing colours & patterns, plus fancy sandals. One of her favourite things in the world is temporary tattoos. She always has a random assortment of smudged ones up her arms, as well as some very odd tan lines from previous ones. Can't wait to see what the next month brings with this energetic & creative little person.